Posted on Fri, Mar 9, 2012 : 5:07 p.m.
Tavelyn James and Paige Redditt had their sites set on finally beating Bowling Green in this year’s Mid-American Conference Tournament championship game. But, thanks to its two senior leaders, the Eastern Michigan women’s basketball team will, indeed, play in the title game. James single-handedly got the Eagles within striking distance late in a semifinal against Toledo and Redditt sealed a 59-57 win Friday afternoon at Quicken Loans Arena in Cleveland. 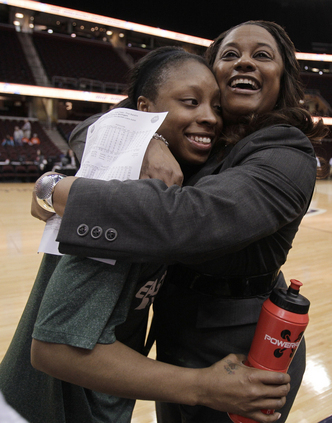 Eastern Michigan coach AnnMarie Gilbert hugs senior guard Tavelyn James after the Eagles' 59-57 win over Toledo in a MAC Tournament semifinal. Eastern Michigan advances to the championship game at 1 p.m. Saturday against Central Michigan, which upset No. 1-seed Bowling Green in the other semifinal. Bowling Green, the two-time defending tournament champion, is the only MAC team James and Redditt have not beaten in their four years at EMU. They’ll give up a shot at beating the Falcons for a chance at topping the Chippewas for an automatic bid into the NCAA Tournament. James put together a late charge of her own against Toledo, which led by 10 points midway through the second half. The MAC Player of the Year hit a 3-pointer with 2:07 remaining that cut the Rockets’ lead to 57-54. The senior guard then came up with a steal at midcourt and was fouled on a drive to the basket. She hit both free throws to make it 57-56 with 1:56 left. James came up with another steal on Toledo’s next half-court set. On EMU’s ensuing possession, Redditt scored from the post to give the Eagles their first lead of the game, 58-57, with 1:09 left to play. Redditt split a pair of free throws with 27.1 seconds left to account for the Eagles’ final points. Toledo played for the tie on its next possession, but Courtney Ingersoll missed a layup. Ingersoll rebounded her own missed shot and kicked the ball out for a potential game-winning 3-pointer by Haylie Linn, but that was off the mark. James and sophomore Natachia Watkins scored 19 points apiece for the Eagles. Redditt added 11 points, Olivia Fouty pulled down 10 rebounds and Desyree Thomas dished out nine assists. Yolanda Richardson finished with 15 points and 10 rebounds for Toledo. The Rockets led 28-23 at halftime after the Eagles made just 10 of 40 shots from the floor in the first half. The Eagles forced 16 Toledo turnovers to keep the game close. EMU was a much more efficient 12-of-29 from the floor in the second half.